Specialty silk fabric from Treetops Colour Harmonies. Outback Fibers has all the fibers and fabrics you need to make fabulous nuno fleted garments and accessories. In addition to this habotai silk fabric, Outback Fibers also sells dyed silk gauze / tissue silk fabric to coordinate with our superfine space dyed merino. Our fabrics allow you to produce incredible results for your Nuno felting projects. Have a look at our very open weave silk gauze called Butterfly Silk Fabric from Uzbekistan. What is Nuno Felting? It is the technique of layering very small amounts of wool onto a woven fabric. The base fabric is usually silk or cotton. Through the felting process, the wool fiber migrates into the fabric. As the normal shrinkage from the felting process takes place, the fabric is ruched, creating unique textures in the product. This process is also called "laminated felt"
Our Habotai Silk Fabric matches our line of superfine space dyed Merino Harmonies wool fiber which is available in stunning complementary colorways. 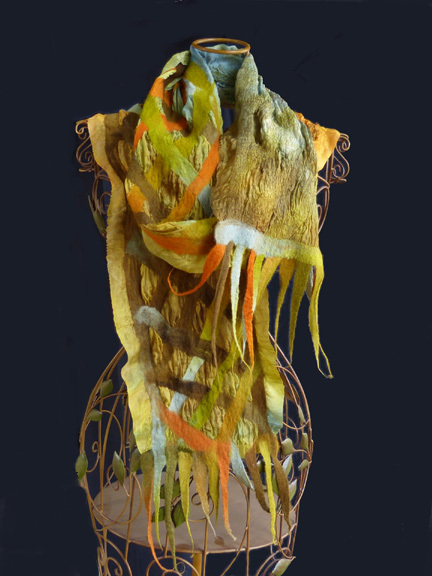 Our Neck-Knack Scarf Kits in Habotai Silk are prepackaged kits containing silk fabric, Merino wool, and clear instructions to create a beautiful scarf. Click here to see the kits.